KEREMEOS, B.C. 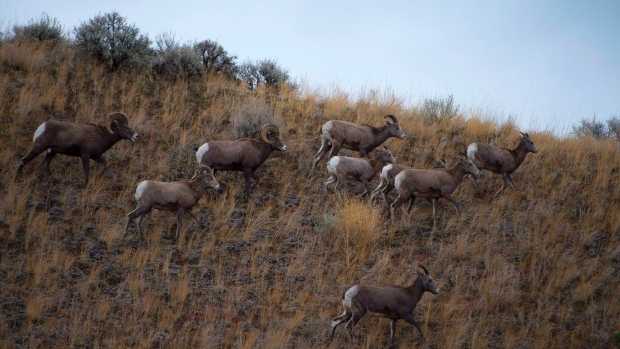 - Two British Columbia drivers who allegedly ran into a herd of bighorn sheep with their pickup trucks, killing five animals, have been charged under the Motor Vehicle Act. The collision occurred on Oct. 1, on a four-lane stretch of Highway 3, near Keremeos, about 350 kilometres east of Vancouver. Mounties say westbound vehicles that had been travelling in the 100 kilometre-an-hour zone stopped for the herd of 12 sheep. But police say two pickup trucks driving eastbound didn't stop and hit the herd, killing five and injuring two animals, before leaving the scene. Mounties say the impact launched some of the sheep into vehicles sitting in the westbound lanes, resulting in damage. The names of the 56- and 75-year-old drivers have not been released, but police say the men face charges that include failing to report the accidental killing of wildlife on a highway and driving without consideration.